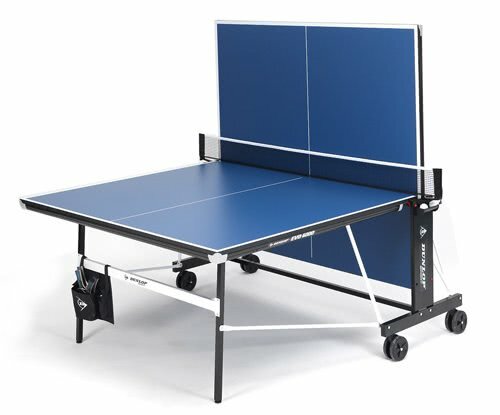 The Dunlop EVO 6000 HD indoor table tennis is a high quality table that has a 19mm premium top with melamine coating, a sturdy steel construction with a full steel side panel and extra wide wheel support beams. As well as this fantastic build quality the EVO 6000 is easy to use with a Dunlop designed QuickLock Plus DRS system that makes it easy and quick to fold. This superb table also features adjustable feet for levelling and an integrated net and post that is adjustable. The table is supplied with a comprehensive accessory pack so you can play as soon as it is set up. A double folding one piece rollaway design frame for easy storage which includes a permanent net and post set, full steel side panel for strength and long life plus extra wheel support beams. 4 twin 120mm casters with 360 degree swivel, mounted on strong 25mm square section steel frames.